For the first instalment in this series of interviews I spoke to Maria Kapajeva, an artist from Estonia who lives and works in London. Her multicultural background drives her practice: a diverse spectrum of cultural identity and gender issues within historical and contemporary contexts. She works with stories and histories that grow out of her collection of vernacular photography that she finds in archives, old family albums, on the internet or in flea markets. Kapajeva deals with political and social issues of the past, questioning how they resonate in people’s contemporary lives. She looks for stories that have been forgotten and are about to disappear. Using photography as a starting point, Maria works with video, installation and object -based art. She embeds found objects and images into unique pieces using various printing and stitching techniques. I’m interested in the two areas of your working life: your personal practice and Fast Forward: Women in Photography, a platform designed to promote and engage with women in photography across the globe. How did you come to work with photography, did photography choose you or did you choose photography? It was both in a way. As a child I remember spending time with my father printing photographs in our bathroom, and then as a teenager I would regularly photograph my friends or experiment with self-portraiture. When I finished my degree in economics later on in life I started to work in an office. Throughout this time I was experiencing a constant dissatisfaction with my career so I started to unconsciously look for something else. Around the same time the big wave of the internet arrived and I developed an interest in collecting images online, just random photographs. At some point I realised I wanted to take photographs. It was a close friend of mine who gave me a camera, he knew of my interests in photography and that’s essentially how it all started. I became obsessed. I took pictures constantly, learning more and more, it really fascinated me. Whilst I was still living in Estonia I entered competitions, small exhibitions and at some point I decided, due to a combination of different events, to apply to photography courses in the UK. I really felt I had nothing to lose. I didn’t tell anyone that I was secretly applying. As soon as I was offered my first place I told my close friends and family as I had decided straight away I was going. That’s how it started. How did the course help define your practice? I had very little knowledge about photography and its history, except maybe Henri Cartier-Bresson. I didn’t know who Martin Parr was, I remember that clearly! Arriving at Farnham opened up the whole world for me. The Farnham school was great for the support but I almost think for me at that stage I was just looking for a gateway into this world and Farnham provided that, especially in the first year. I was literally dancing in the darkrooms, I was so happy. I was completely overwhelmed as there was so much to learn. It was so exciting. Your work focuses on the stereotypes and issues that surround women in society. As you and I are both aware, women artists face a multitude of challenges and are known for using their practice as a way to highlight these issues. Firstly, and because I know of your geographical trajectory over the years, could you tell me what the differences are between the art scenes in Estonia in comparison to the UK, and your thoughts on the representation of women artists? I don’t think I am in a position to compare them. I am aware of the Estonian art scene and I am familiar with artists working today but as I am not there everyday, I would find it difficult to know what it’s like for women artists to work in Estonia. I follow a lot of discussions and debates and it is still very much the case, underpaid and ongoing difficulties but at the same time there is an extremely proactive group of people working hard. The younger generation in Estonia are women who are actually doing a great job for contemporary art so it’s definitely a positive change. In terms of the representation of women in my work, it’s a journey for me. Having been involved with Fast Forward: Women in Photography for a number of years now I have learnt to always question the issues that face us, what it means to be a woman, why we are meant to do this or not do this – all these basic questions which we grow up with and which form our ideas of how the world works. I think my artistic practice helps me to deal with these questions to try and find, not so much the answers, but the ways to ask them or have a conversation with other people. With Fast Forward I take the time to educate myself in statistics, the reality of the situation, debates and discussions taking place. It helps me to understand what my own thoughts are around the discrimination of women. As you will know from my work, issues surrounding the representation of women form a big part of my artistic practice. I think this comes from a need to respond or change my default thinking. The majority of stories we are exposed to, and the system in which we are taught, especially historical stories, are from a male narrator. I believe there is a lack of stories from a female perspective which are recorded within our history. Fast Forward’s main objective is to bring visibility to forgotten names, to celebrate women who work in photography, to study their practice and highlight important areas of their lives. As for my practice, I also deal with forgotten stories and stigmatised imagery often of women, to alter the vernacular that is being used. So for me, every voice matters, and it is important to look at historical and contemporary events more objectively. I remember Anna Fox, Professor and Photographer once saying her goal in life was to contribute to the history of photography. This has remained with me for many years and has always been something I feel is an important goal for artists and practitioners to contribute to, or certainly feel part of the history of art. Within your practice you also explore areas of curating, please could you tell me about Fast Forward and the curatorial project One Image Story? Could you talk me through the impact this is having and why you feel this online platform is important? As an artist there is no way that I am thinking about contributing to the history of art, but as a researcher, yes. What I find is important, again as I mentioned before, every story matters. It’s essential that we are continuing to make these issues prominent. For example, when I was at university being taught the history of photography, if you were to trace my notes from those lectures the majority of names mentioned would be men. That’s what frustrates me because many of us have been educated in this system, and it needs to be stopped. We need to educate people and encourage more stories to be told about female figures throughout history. We need to make more people aware of these issues especially within the education system. That’s really why I was attracted to Fast Forward, to contribute to that discussion. The whole idea with Fast Forward is to develop a platform for those conversations to exist on an international scale. For instance, Anna Fox who leads the project has been successful with funding from the Leverhulme Trust to organisation a series of international research workshops across six countries. That is what we are working on now with an aim to build up the network and open up discussions with partner organisations and the participants of the workshops. I think the international representation on our board (including myself being from Estonia) is the key element for us to be consistent in asking whether we do enough to look outside of the western world, do we do enough to represent that? One Image Story was always a small idea that came from this international format and the need to connect. When the idea came to me, I realised that I can actually ask anyone from anywhere to work with me as long as they have access to a sound recorder. It’s really very simple. As well I was very interested in this idea of how we all are exposed to hundreds and thousands of images every second of our day. Nowadays it’s really hard to convince people to sit and listen for one hour, even to read a long text is difficult. I thought two minutes would be enough time for the artist to say what they want. One Image Story is a collaborative process between myself and the artist. It’s a very different conversation each time. The artists are proposing an idea or I am suggesting a particular approach. It really becomes to be, for some, very experimental. Each artist attempts to create something for the project, like writing a text or using a computerised voice. It’s quite fun and I hope people find it exciting. I would like to talk to you about the role of found imagery and materials such as textiles and embroidery in I am Usual Woman, Interiors and My Half? Actually it’s quite interesting. I was thinking the other day about why this has happened within my practice. In 2012, I was living between three different places, I was travelling and was working a number of jobs. It was exhausting. I had zero amount of energy to create new images so I ended up using the Internet and searching for inspiration. That’s essentially how my series Interiors started. It was using these found images and creating digital collages out of them. That led me to my first big body of work on Russian brides, exploring the mail-order bride phenomenon. I visited so many online sites and found thousands of images, which amassed into a collection. It actually put me in a really hard situation where I had collected so many images how could I possibly now go and create new ones. I started to question this need to constantly generate new photographs or ideas. Instead maybe I could use these images to find a way to appropriate them. This transition really opened up my practice. With my work, I am Usual Woman, I have always wanted to make something like this. I was at a stage in my practice where I was looking for form and output. I had a Skype conversation with my mum, who is a patchwork artist, asking about these patterns for quilting and she told me there is one quilt specially created for weddings, it is called ‘Double Wedding Rings’ and is well known in America as well as in the UK. This conversation right away made me want to use it as part of my Russian brides work. The process then was to find the right images and to explore why I wanted to work with patchwork craft. It immediately felt very natural and very much apart of who I am. Both of my parents used to work in a textile mill and I was brought up around my mum who has been stitching all her life. She made of all my clothes when I was young with textiles being a strong presence in my life. With this piece of work, I am very much going back to a comfortable and familiar material. I absolutely feel I have an understanding and connection to the fabric. I can imagine this work is very time consuming for you, quite different from taking a photograph? Well, taking a photograph can absolutely take a long time. It was almost a way of discovering myself as an artist. For my work Fifty / Fifty, which is a hand-made cross-stitched tapestry installed together with a sound piece, the stitching process took over six months to create, it was every evening and weekend. I must admit, it did some real damage to my back. 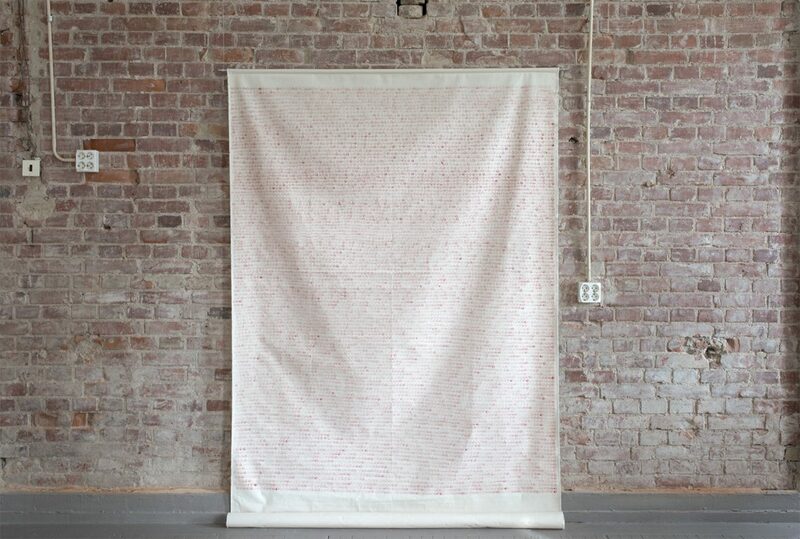 I have also recently completed the work 12,000 where I stamped the logo from a textile mill onto unbleached fabric. This was incredibly monotonous and repetitive but yet very creative and calming. The level of concentration has since become part of my practice, which at the time I didn’t realise but very much enjoyed. The process of stitching or stamping is a really dramatic action. I would do this everyday and would find this routine and level of concentration quite therapeutic. You can easily forget about the rest of the world, forget about any other decisions I have to make. It has informed a lot of my practice moving forward, without really releasing. The work you produced for your solo exhibition Dream is Wonderful, Yet Unclear is your largest exhibition to date, containing of a number of individual works. I’ve recently had the privilege of hearing you present this piece of work. I am particularly interested in your work Mapping my Mother and Fragments of a Conversation. Do you see this work as a collaboration with your Mother or homage to her? Or do you see it as a personal approached to understanding and exploring your identity? I think it’s more the second. I spent a very long time exploring a few areas before starting to think about the work Fragments of a Conversation. With the exhibition Dream is Wonderful, Yet Unclear, which was based on the social heritage of an old textile mill and interlacing personal histories as both of my parent used to work in the mill, I couldn’t escape it. 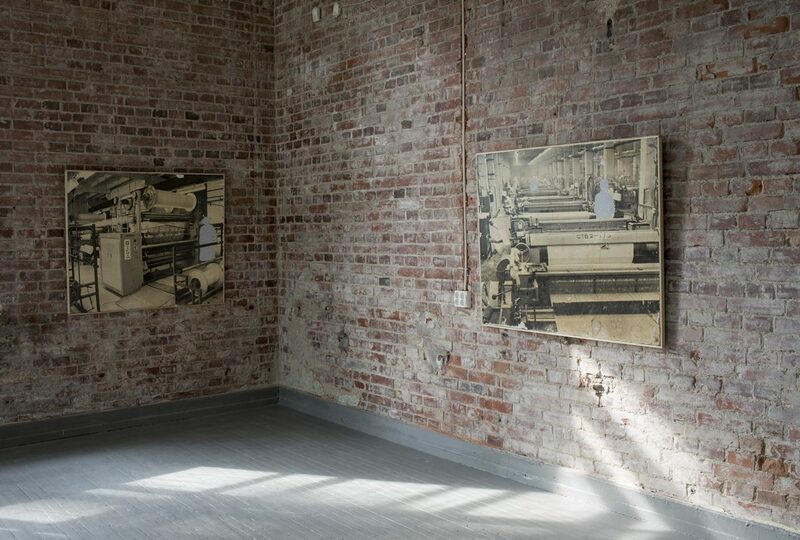 It was almost the reason I started this work with my mother, even though the other pieces in the exhibition are more related to the textile mill. The piece with my mother is a very different body of work. Saying that, the individual works throughout the exhibition successfully exist together. Seeing the video piece [Fragments of a Conversation] in the context of that exhibition was eye-opening. I received some feedback informing me that my mother represented the women of the textile mill who do not have a voice. A big part of the process was to confront my relationship with my mother, and to then sit and record hours of interviews with her. Using this format in a way speaks more about my personal frustrations and my attempt to have a conversation with my mother. This is also an attempt to have a conversation with myself about my mother as well. It is not easy and I don’t think I will ever have the words to describe this feeling because, in a sense, the visual imagery speaks more for me than I can really verbally describe and express. I feel there is something within this work that I know is disturbing but really that is the whole point. It’s not supposed to be a comfortable video to watch. Mapping my Mother is a very exciting project. I started this work at an artist residency in Estonia but continued when I travelled to Lithuania. I used the walls in these building to make markings using patterns taken from my mother’s textile designs. I thought it was going to be a one-off piece but suddenly this act of mapping my mother was the act of leaving a record of her everywhere I went. I very much see this work as a way to represent the women who have contributed to the textiles industry. I hope to get a chance to continue this site-specific work is various spaces around the world. 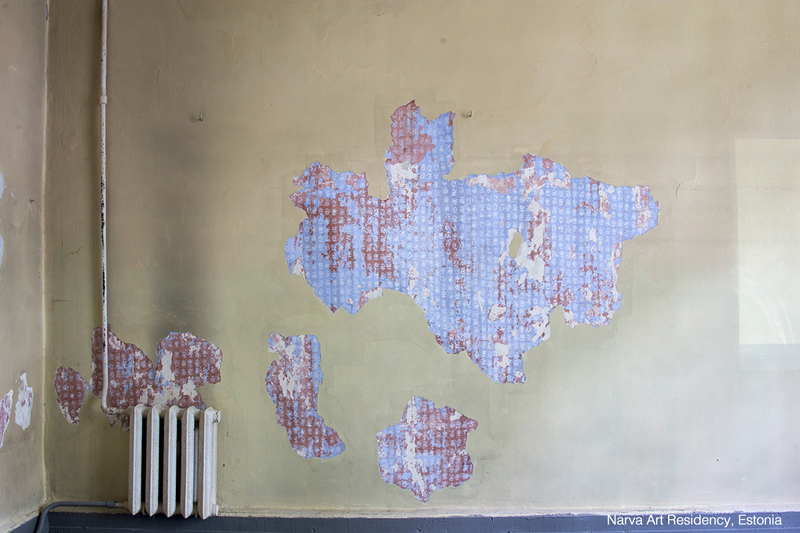 Could you talk to me about your experience and time spent at Narva Art Residency in 2017? The residency was an amazing experience for me. In 2016, I was invited to be the first ever artist in residency mainly because my work had a strong connection to the building. The building used to belong to a textile mill where my parents used to work. When I was a child I used to do dance classes in the rooms where I was working on my art practice and later exhibited in. So the building has a very strong personal relevance. That was a really exciting part of the residency. However, at the same time there was very little structure. I was kind of like this lab rat for them. They tested things on me, which can sometimes be a bit difficult especially if you just want to come and work in privacy. I think because of my connection with the place I have developed a very good relationship with the residency. They have actually since invited me to be on their advisory board. It is in my hometown so I am more than happy to contribute when I can. It is a very exciting organisation that has very good credentials. Can I ask you about The Bright Way, a new video piece? With similarities to Fragments of a Conversation, you make yourself very present in the work either by playing with the camera’s functions or by speaking over the video. Please could you talk to me a bit more about this? I think it’s one of the exciting things that is happening within my video work but I am not sure I am ready to fully define the reason for it. I’m actually quite interested in having a conversation about the work and hearing what other people think. I am present within the work, is this important or not, or is it disturbing? I’m not sure. I am interested to know how viewers react to the piece. At the same time, I am aware and keen to explore the power relations between the Director and the Actor, especially in The Bright Way. In this video, I am invisible but very much present as you can hear my voice giving constant directions to the Actress. I am discussing with her how to move, how to look. I am trying to deconstruct a well-known image of a heroine from the cult Soviet movie with the same name The Bright Way. I’m enjoying this process and method of working. It is similar to the work I carried out in another video work Test Shooting, produced in 2016. I made a simple decision not to switch off the camera or sound recorder at any point throughout the filming. In both works my presence and voice becomes part of the work, it’s a collaboration. Can I ask you about the political referencing in some of your work and how this relates to you, your life and your identity? I watched Thinking About Consequences and was quite shocked at the sounds being played over these abstracted and distorted images. It was quite haunting reading your reaction and the interface with Facebook – a platform which feels quite lacking in its social responsibility. Can you talk about how politics comes up in your work and how this relates to your personal experiences? I think this is the first work where I have experienced personal frustration as an artist. The frustration stems from not being able to produce immediate work that reflects immediate events. I am exposed to a lot of news and political events with the refugee crisis being a big topic in my life. I went to Calais as a volunteer and I purposely made the decision not to even think about making work there as I realised it placed me under so much stress. I need a longer period of time to digest events to be able to produce work. This still frustrates me as I can see other artists that manage to do this in a more dynamic way. I want to be more responsive. I understand my methods of working are very different and they do not fit a reactive process, however with Thinking About Consequences it was quite revealing. When watching that protest online and seeing these broken, distorted images I decided to screen grab as many as I could. I then started to process my reaction, a reaction quite similar to one that we all experience and deal with on a day-to-day basis when interacting with the news. It’s a strange situation as we all watch these images on the TV and then just carry on with our lives. We are completely overwhelmed with news and images that we stop reacting to things. It’s like next, next, next. That was my first attempt to say something in an artistic way. I really hope I can produce more works like this, but I feel it is hard to plan, it can come and go at any time. I’ve noticed in your work you use analogue forms to create and interfere with imagery. You seem to be very aware of the artist’s hand as a way to mimic the digital characteristics of Photoshop. I’m specifically referring to Cutbacks where you have removed the figure from the image and replaced it with a background pattern, quite reminiscent of using the cut tool in Photoshop. This analogue to digital shift in photography has created an ongoing dialogue amongst practitioners and theorists in how photographic practice is defined today. Could you tell me a bit more about your relationship to analogue and digital processes and how these elements feature in your work? I think the uniqueness of an object and the production of crafts are important to me as an artist. I tend to work a lot on screen, this is a language I understand. When I work with objects and these unique, one-off pieces like the found photographs in Cutbacks there is no way I can digitalise the unique story they offer me. It is important that as objects they retain their history. For me as the artist, I have to question whether these objects work together, whether their history is important or whether I should ignore it? I have to ask myself these questions to ensure I am producing the work I am happy with. In this case, these objects and photographic propaganda posters have an important story to tell. I have to get to the bottom of their history and create something unique with them. I think it’s a part of the literal joy of working with materials because working on a screen can be very tiring. I have this need to physically cut, stamp or stitch to be able to produce a piece of work. It’s a very different type of concentration that I have when working with a piece of work, or the work-to-be. There is a joy of working with a physical piece and to evidence its transformation during the process. With Cutbacks, if viewing them from a distance, you will see a surface image of the figures cut out. Maybe you read the Photoshop interpretation, maybe not, but as you come closer you see it’s been cut brutally with a knife and replaced with Photoshop markings, which are not perfect, even though I tried. The markings have been hand-painted with a brush. As you view the work close-up, you become aware of this human presence and the act of violation and appropriation these figures in the photographs went through. I hope it will raise questions in the viewers’ mind as to why it was done in this way and if the artist is trying to say something with it. I’d like to ask whether you see yourself as a photographer or as an artist? Do you feel this is an important question to ask, or one that no longer requires defining? I do call myself an artist, although it is quite an ambitious term, which I often laugh about or find a bit awkward. However, by saying I am an artist and not a photographer, I manage to avoid these conversations where people ask, “what kind of photographs do you take?”. I then have to explain again and again that I actually don’t take any photographs, I stitch, I stamp, I film. It can be very confusing. I wish there was more of an understanding between these terms. I realise that actually the job of a photographer generally includes that of a commercial or editorial side so it’s not only fine art. In these professions the term photographer is absolutely required and I think it’s certainly on a personal level that some people only use the term photographer in their practice, and of course some do not. It’s their choice and it’s good that we have this free choice. 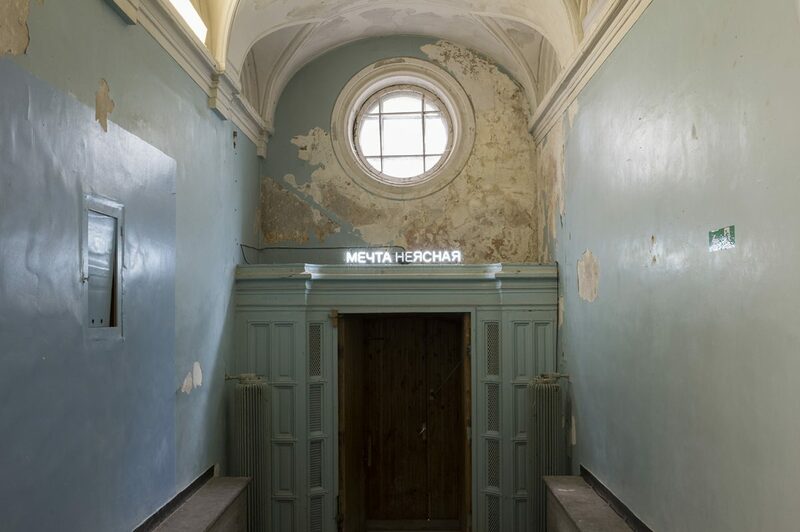 You have carried out residencies in Estonia, Iran, Slovakia and Finland. What do you think the importance of residencies are to an artist’s career? If you were to build one yourself, what would be the top most important aspects of one? I think residencies are important but they are not for everyone or every artist. It depends what you’re looking for. It is definitely a way of discovering places and people to expand your network. What is maybe more important is having the time and space to not be disturbed with your routine. It helps to find space in your head to produce, and be productive with work. That’s why I believe a lot of artists who live in the big cities carry out residencies more than artists that work in the smaller places as maybe these people can find peace more easily. Living in London is really hard to sustain my practice. Even working without a studio is hard, sometimes almost impossible. When I undergo a residency I tend to plan almost like a year or some time in advance as you have little disturbance and you can focus fully on your practice. With some of the residencies that I have undertaken I have been quite effective in the production of my work. When I was in Slovakia I went on a three month residency, which allowed me to balance having a break, undertake activities such as cycling and swimming, and then go back to the studio and continue with my work. Short residencies are great but can be very stressful because you have little time to absorb the new culture, the new place, and produce new work. It is possible to do residencies like this but not often. The key components of any residency is to offer time, space and financial support for an artist. I think that’s what artists need the most. It is very important that the residency financially supports the artist, supports the production and covers basic needs. Then the artist can focus on their work. I also think its interesting when the residency somehow supports the artist to interfere with the local community whether this is a direct collaboration for a new piece of work or organising workshops. This would ensure the local community are aware of the presence of the residency and that all can benefit. I think that this is important for a residency to ensure the local community are meeting artists from all over the world. This is especially important in small places when art and culture are not as accessible. Do you find it easy to live as an artist? Do you think there are too many artists nowadays? It is a serious problem to survive as an artist. If you choose to take this path, you should be aware of the situation and difficulties that artists experience and how hard it is to sustain a living. I believe the people who call themselves artists, who try to survive, they do it because they love it or they cannot see any other way to live. There is no question that it is really hard. I think the global connection that is growing between organisations through a residency platform helps different countries realise the importance of supporting artists. Over the last 10 years so many residencies have appeared and now exist, however, residencies are a small part of the infrastructure, which still requires further support. I think we are going through a difficult and hard time with Brexit and unfortunately I believe the arts, and education will certainly be the first to suffer or be cut. It is becoming harder to sustain your life, as there is no way to relax. You’re constantly experiencing that stress. There is minimal support for artists. I actually only know one residency in Berlin, which offers space for artists to rest and to reflect on their work with no obligation to produce something new. However, unfortunately even this residency programme asks for a fee. It’s so important to be able to afford the time off and to recharge yourself. The recognition of an artist as a career is very important and still hardly acknowledged anywhere in the world. 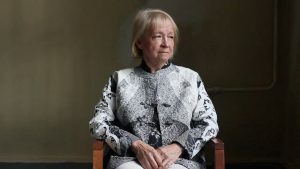 In Estonia, for example, a few years ago the government supported a trial to support an artist’s or writer’s salary for three years. It would be great to see more of that happening in other countries. The UK has a well established support system for the arts. The Arts Council, England is a major player in developing this system. However, at the same time, it only supports the production of the work, it doesn’t recognise that artist needs to be paid for their holidays. A big part of the creative process is actually taking a break for reflecting, to read, to research or any other activities that might be essential. Do you ever get fed up with this way of life? And if so, where do you turn for inspiration when this happens? I have ups and downs, and from time to time I have doubts as to whether to continue or not. I tend to ask myself ‘what else?’ as I still remember the office jobs I used to do many years ago and my lack of any desire to carry out a career like this. I would probably spend my whole life in one boring office job, which would end up being the boring story of my life! Being an artist and being in the art world really drives me to keep questioning myself and my views. I am constantly educating and expanding my knowledge about this world and myself. At the moment I don’t see an alternative, which could give me the same drive. Maybe one day I will find it, but today I am definitely an artist who is trying to find her way to survive and be productive.